Yummy and cheap! Vegetarian and almost Vegan. I really love mozzarella sticks, but the price and grease keep me from getting them often. Also I don't like ordering such things when I can't be sure it's cooked away from meat. I took the basic way to make yummy sticks and made it a little healthier. Enjoy! I will add pictures of the process next time I make this. First things first unwrap you cheese sticks. 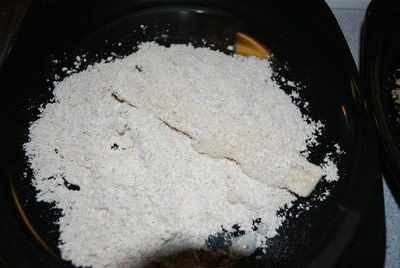 Put you bread crumbs and flour in 2 SEPARATE shallow bowls or pie pans. 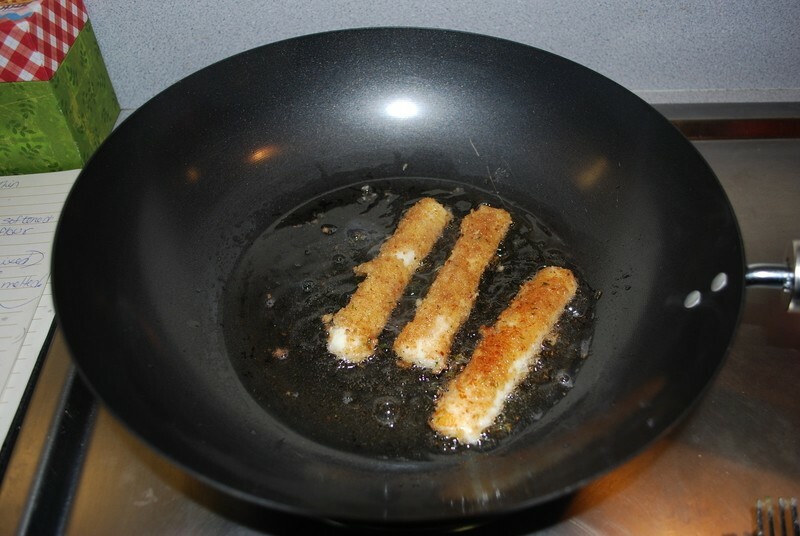 Now is the time to heat your oil (1 inch) in a wok or saucepan with large brim to med. heat. Mix together your egg alternative equivalent of 2 eggs and the 1/4 soymilk. Put this into a shallow bowl. Take a cheese stick and dip it into the egg + milk mixture, allow the excess liquid to drip off and immediately put the cheese stick into your flour bowl. 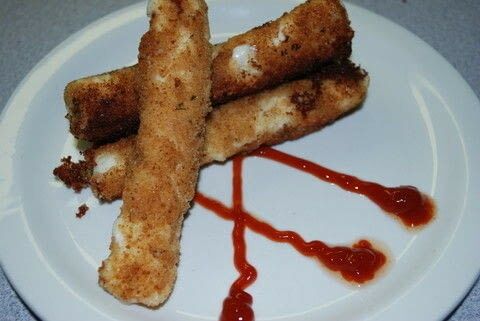 Roll the cheese stick around until it is completely covered in flour. 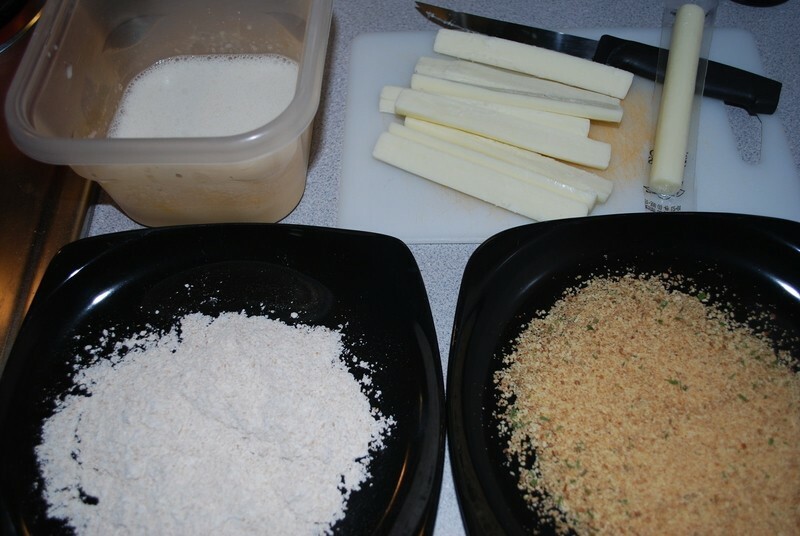 Now Dip it in the egg + milk mixture AGAIN this time you roll it in the breadcrumbs. (egg+milk, flour, egg+milk, breadcrumbs) place the stick in the hot oil. Once your sticks are golden brown or the cheese begins melting through remove from oil. If you have paper towels blot the extra grease away. If you would like some marinara sauce to dip your sticks in you can use spaghetti sauce or process/grind a can of Italian tomatoes. Now I just have to find vegan cheese sticks to use. I'm going to have to try this! I LOVE these but they are expensive in the restaurant and less for what you pay for! okay, just made this with my boyfriend and it turned out SO GOOD! Likke yum! I can't believe how fast and easy it was to make. Thank you for posting this. Mmmmm... I'm definitely giving this a try! I'm definitely trying this...they look yummy and much cheaper then buying them as an appetizer as my dd is prone to do! WOW-Thanks everyone for the favs! Love to see your versions! Thanks for the tip, I personally prefer my cheese stick restaurant style, all gooey and amazing inside.